As adults we need the capacity to wait, and it appears many adults don’t possess it. From the person huffing and mumbling behind me in the checkout line to the car behind me in slow traffic, other adults are impatient. The culture caters to this at the moment. On a drive last week I passed a billboard which displayed how long I could expect to wait in the hospital’s emergency room. I can’t imagine rushing an emergency to take advantage of the short wait time! Waiting is seen as so unpleasant that in every place I will need to wait someone has installed a television. So the doctor’s office, the airport, the gas station and the grocer store sport televisions. If a transaction takes a couple of minutes a clerk will almost always apologize for making me wait, fending off my potential criticism I guess. Mindfulness seems designed to teach people to wait. It encourages them to be in the moment, not in the future. I didn’t need to take it up to learn to wait. I had many years of experience waiting while I grew up. Now I treasure those times of stillness, when they aren’t interrupted by a television, when the only thing that I have to do is wait. Boredom is really underrated. I imagine Newton being too busy to lie under that apple tree. I remember the class list so well. Who did I have? Who was in my class. And then buying school supplies. Anticipation is a wonderful thing. It made a huge difference in our lives didn’t it. We may never know the true impact. It gets easier once you retire. As does sticking to speed limits. Blessed are you! 😊 I am not by nature a patient person and hate waiting in line. Thanks for the reminder to relax and live in the moment. Deep breathing helps too. As does looking at the headlines in the gossip magazines. I also grew up carrying a journal around with me, and paperbacks, and often crafts like knitting, so anytime I had to wait somewhere I was fine and self-entertaining if needed. When I got detentions in high school, most often for silly things like not wearing my jacket in the hallway, I would sit there for the hour and sing musical soundtracks to myself in my head, and not suffer at all. It taught me to be with me and be okay with it. Glad to hear from you again. I got detention in high school for arguing with my history teacher about imperialism. I agree that I learned a lot from waiting for phone calls both for those that came and those that didn’t. I am impressed. The most brazen stunt in our school was my friend who rode a motorcycle in one door, down the hall and out the other door. They wouldn’t let him march at graduation! That is rather beyond my idea of a good thing to do in school at that time period! It was a big hit among his peers. I am one of those who can’t abide latecomers. When you say 8 am, I’ll be there t 7:30 am. I really don’t like waiting. I hate waiting for latecomers, I do admit. Well said. Waiting is not popular, not at all. A few years back I reframed and now I consciously enjoy waiting… most of the time. I do think it involves reframing. The only struggle I continued to have was being trapped in traffic. Now I play an audio book and all is well. I will be glad to see them. We don’t have TVs in the doctor’s, dentist’s, or most places where we have to wait. There is still that ‘English Reserve’, sitting quietly and patiently, perhaps taking one of the well-thumbed magazines. But everywhere has seen the installation of ‘play areas’ for children, guaranteed to shatter those ‘moments of stillness’. I could us a little “English reserve” here. 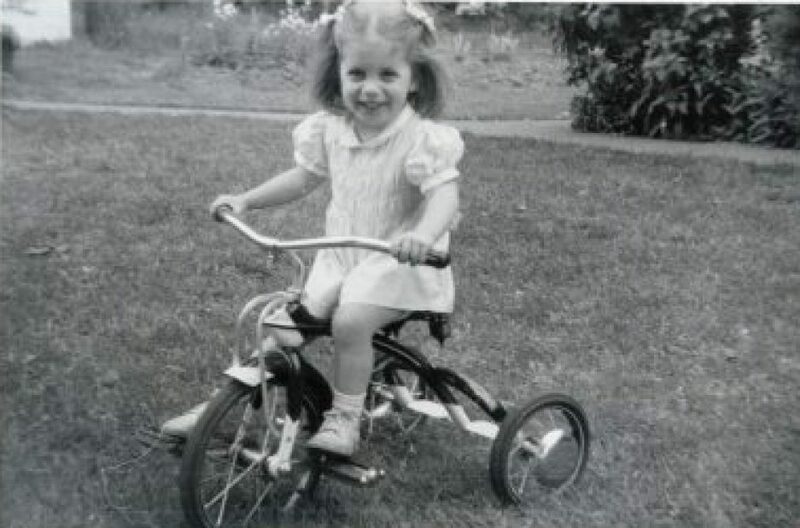 Hi Elizabeth – first of all I love that someone captured you in this moment of seeming unhurried quietude as a child. I, too, have felt that people (is it the fault of all this instantaneous technology?) are more impatient, rushing and hurrying for no real reason. I walk a lot and I am always chagrined by how often people driving in cars seem annoyed by pedestrians – as if we are really slowing them down and making them late for something! I think that clerks must be catching a lot of grief – I’ve noticed what you mentioned about them apologizing if a transaction isn’t happening in a snap. I sometimes let people know that I am in no hurry. Or if it is apparent that someone is new or in-training, I like to encourage them to take the time they need to do things right. Maybe my sensitivity is heightened by remembering my days learning how to do different customer service jobs. I was a pretty contemplative kid, so this photo may have come easily. I think the impatience preceded the technology. I think at some point it became the cultural norm to complain about waiting. I still have no idea why. So true – waiting was a normal and accepted use of time in the not so distant past. Now, people are offended if they have to wait for anything. “Waiting with grace” is something kids (and to be fair, many adults too) who are growing up in this era of instant gratification should be taught. I still can’t figure out when people decided it was an imposition to wait rather than a normal part of life. Very excellent point. Humans are getting less and less patient. How much more we can learn when we take our time! Well, you have a lot of company in the U.S. anyway.